Charlie on the MTA – Did He Ever Return? A Charlie and the MTA Christmas! Charlie on the M.T.A., Did He Ever Return? is an enchanting and lyrical new children’s book from Boston-born and Maine-raised author Julia M. O’Brien-Merrill and Boston based illustrator Caitlin Marquis. It will be published in July of 2017 by Commonwealth Editions, an imprint of Massachusetts-based Applewood Books. Do you know why the transit fare card in Boston is called the CharlieCard? Young readers will find out, and should bring an extra nickel along, when they hop aboard the “T” to follow Charlie through the streets of Boston in 1949. The full-page magical illustrations of Caitlin Marquis will take readers on a ride above and below the streets of Boston as they were in Charlie’s time, zooming past familiar landmarks—many still standing, some long gone—wondering all the while, will Charlie ever return? 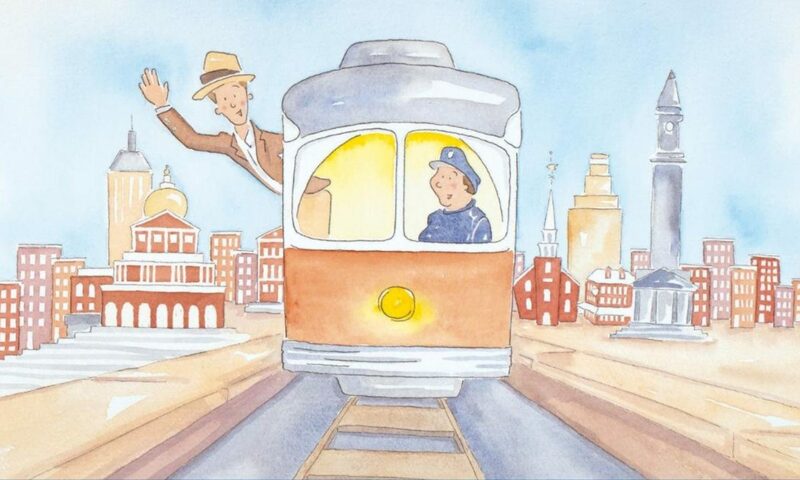 This delightful children’s book, the author’s first, is the story of a much-loved song, a great American city, and some fascinating history of both. The melody of “M.T.A.” originated with Henry Clay Work’s 1865 song “The Ship That Never Returned.” Many decades later, Bess Lomax Hawes and Jackie Steiner wrote new lyrics for the 1949 Boston mayoral campaign of Julia M. O’Brien-Merrill’s father, Walter A. O’Brien, Jr. O’Brien opposed the Metropolitan Transit Authority’s recent fare increase, which charged subway riders an extra nickel to exit trains at stops above ground. O’Brien’s campaign song told the story of poor Charlie, who could not pay the nickel and so was doomed to ride the subway forever! Throughout the song, stations and neighborhoods of Boston were name checked – Kendall Square, Jamaica Plain, Chelsea, Roxbury, and Scollay Square. A decade after the mayoral campaign, which O’Brien lost, The Kingston Trio recorded the tune (with slightly altered lyrics), as “M.T.A.” Informally known as “Charlie on the M.T.A.,” it became a hit, reaching #15 on the Billboard charts and spending 118 weeks at #1 on the pop 2 charts. The Kingston Trio’s version became popular worldwide, and was sung at summer camps, at coffeehouses, and at schools. In November of 2004, Governor Mitt Romney, joined by The Kingston Trio, sang “M.T.A.” on the plaza outside Boston City Hall, saying afterward, “I’ve always wanted to do that, since about the fifth grade.” The occasion was the launch, by the M.B.T.A. (Massachusetts Bay Transit Authority) of the new electronic fare card that would replace tokens on the Boston subway system. It was called … the CharlieCard. Julia M. O’Brien-Merrill sets the intriguing story straight using original historical documents and the original “M.T.A.” lyrics of the mayoral campaign song. A timeline at the end of the book has juicy tidbits of Boston’s history, and will inform and enthrall readers young and old. Did he ever return? No, he never returned (and his fate is still unlearned). He may ride forever ‘neath the streets of Boston; he’s the man who never returned. A lifelong educator and daughter of a librarian and a reading teacher, Julia M. O’Brien-Merrill has firsthand knowledge of the power of reading richly illustrated children’s books to teach about the world. She has had the good fortune to teach children in Maine, Pennsylvania, New Hampshire, New York, Tennessee, and China. 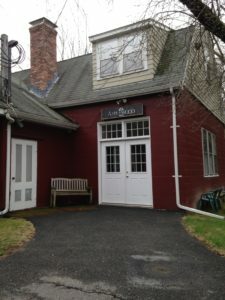 Born in Boston, now living in Maine and retired from teaching English as a Second Language, she has time to play her violin, practice yoga, downhill ski, study Spanish, travel by land and by sea with her husband David, and visit with her westward-ho grown sons. 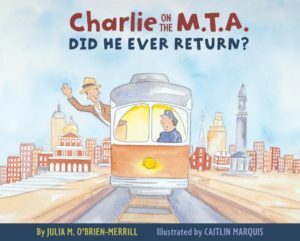 In her first book Charlie on the M.T.A., Did He Ever Return?, she has fulfilled both her own and her father’s dream of honoring his commitment to social justice through a book that will teach future generations about a piece of Boston history. Caitlin Marquis is a Boston-based artist and illustrator. She grew up just south of the city, and has enjoyed painting and drawing from a young age. Caitlin studied art at the Art Institute of Boston and at Harvard University, where she earned her B.A. in history of art and architecture. Charlie on the M.T.A., Did He Ever Return? is her first book. Charlie on the M.T.A., Did He Ever Return?